Another day at V and F and these zintec base plates caught my eye and a good example of various production methods working together. Zintec is a zinc coated mild steel sheet metal that can be used as a good pre-treated surface for components that are going to be painted or powder coated. Zintec can also be used on it’s own in some cases where sheet metal components are kept dry and require minimal corrosion protection. 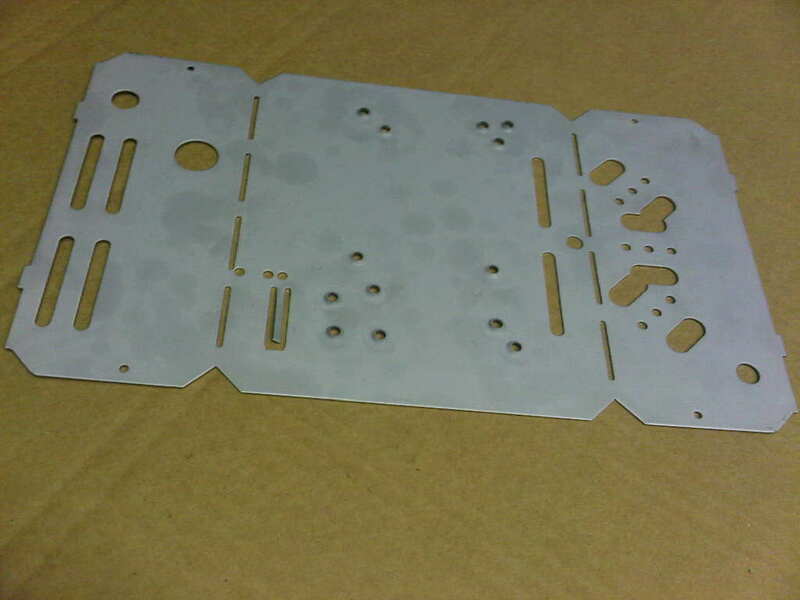 In this case these base plates or a piece of scientific equipment have been manufactured by laser cutting, CNC bending and then having a range of sheet metal bushes and studs inserted using our Haeger inserter and will be powder coated. All the laser cut edges are perfectly clean as they were cut using nitrogen for a burn/oxide free cut. The photo shows how smooth a radiused feature can be when laser cut without any edge de-burring needed. 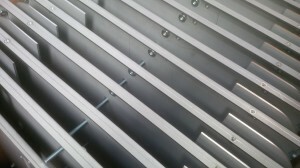 Stainless steel sheet metal work can come in some many different shapes and sizes here at V and F Sheet Metal. The clamping brackets have curved corners that have been formed with bespoke form tooling created by us to suit one of our CNC press brakes. The stainless steel trays are back panels for all mounted display boards. The dimples have been pressed in each corner on our Trumpf 200 CNC punch press and are used to space the panels off the wall when mounting outside restaurants, church halls and schools etc. For more information on standard commercial sheet metal stainless steel grades and their properties please take a look at our web page. If you want to see more examples of sheet metal components manufacture in stainless steel or to discuss your specific project please give us a call. 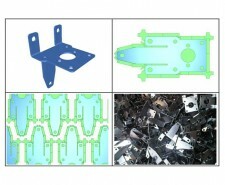 We manufacture many sheet metal components from Zintec material. Zintec is a form of mild steel sheet metal with a thin coat of zinc to protect it from atmospheric corrosion applied at the steel mill to the master coil. Zintec is often used for components that do not need to be fully protected such as computer internal chassis, brackets and rear panels, light fitting gear boxes and covers, air conditioning enclosures and covers etc. Zintec is often a good material to be powder coated giving a better protection to the component if it is scratched through the powder. If you want more protection than Zintec then you can have your mild steel components zinc plated. Exterior components that are manufactured from thicker gauge mild steel can be hot dip galvanised to coat them in an even thicker layer of zinc. These sheet metal components have all been manufactured during May 2013 in our factory in Fareham, Hampshire, UK. For more information on Zintec and how it is produced please take a look at our mild steel data page. The front of our new home is now finished and looks really smart with new signage. Now we are ready for business. If you need any sheet metal work, press work or fabrications please give us a try. Here is just a small selection of images from our recent new sheet metal work projects manufactured here in Fareham, Hampshire. The images have been taken from Radan sheet metal manufacturing software which we use to model all our more complex sheet metal components. The 3D model helps us to create an accurate set of flat sheet metal parts that when bent back up will fit together correctly as intended by the sheet metal designer. The 3D model may be solely created by us or taken as imported data from our customers using either STEP or SAT files. If you want to see more about the software we use to produce our sheet metal 3D models please take a look at our web pages on Radan sheet metal software. If you are not sure whether we will be able to read your 3D data then contact us on 01489 577786 and we can have a chat on file format options. We are really pleased at V&F Sheet Metal to be able to announce that our new website is now up and running. Building on from the last website I wanted to offer customers more information on V&F, our manufacturing services (for those customers who are too far to call in) and most importantly a host of design data to aid you in the design of your sheet metal work. I want to be able to give you the ability check for yourself on our standard CNC punch press tooling whenever you are designing a feature so that you select a tool that is free and readily available to help reduce your lead time. With the bend data section I want to guide you to use the most appropriate bend sizes so that your design is achievable without any fuss or extra cost to you. Have you ever designed a product only to have to change it later to suit the manufacturing restrictions? 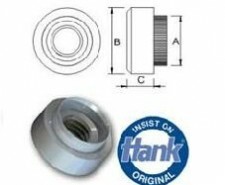 Now you can save time and check out these standard bend sizes as you are drawing them. CNC punching is a manufacturing process that is carried out by CNC punch presses on sheet metal materials. These machines can be either a single head and tool rail (Trumpf) design or multi-tool turret design. The machine is basically programmed to move a sheet of metal in an x and y direction so as to accurately position the sheet under the machine’s ram ready to punch a hole. 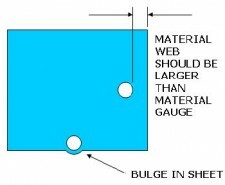 The processing range for most CNC punch presses is 0.5mm to 6.0mm thick in a range of sheet metal materials including steel, stainless steel and aluminium. The choice of hole punched can be as simple as a circle or rectangle through to special shapes to suit a specific sheet metal design. By using a combination of single hits and overlapping geometries, complex can be produced. The machine may also punch 3D forms such as dimples, taptite screw thread plunges, electrical knockouts and earth tags which are often employed in sheet metal enclosure designs. Some modern sheet metal punch press machines may have the ability to tap threads, fold small tabs, punch sheared edges without any tool witness marks making the machine very productive within the component cycle time. The instruction to drive the machine to create the desired component geometry is known as the CNC program.